Perhaps no hero is better suited to working himself up into a misunderstood, self-righteous lather than the Silver Surfer. One false step, one wrong move, and this shiny alien either throws down with a fellow good guy (as in his dust-up with the ever-lovin’ Thing, though, to be fair, it was the Thing’s own jealous psychoses that started that one) or threatens to use the Power Cosmic to cow the dull masses. Temper, temper. It should also be noted that he was apparently a classmate of Loki’s at the accredited Larry Craig School of Throne Sitting. Hang that diploma high! 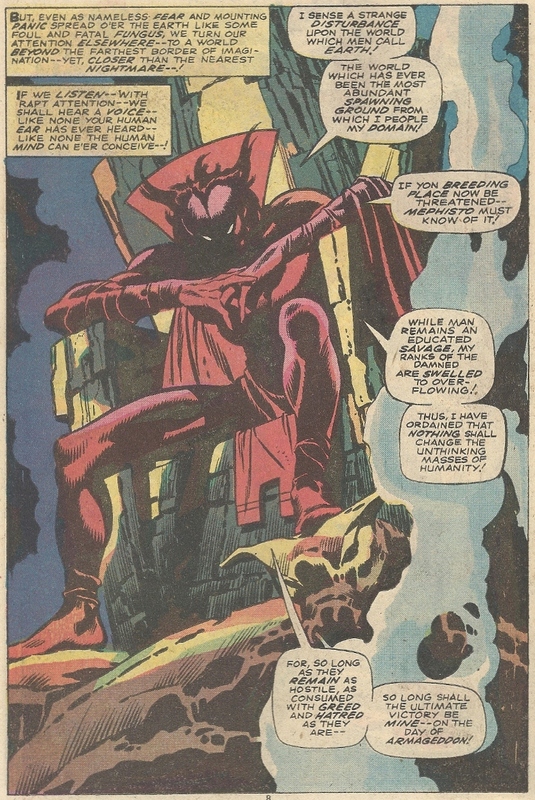 A fine choice, Mephisto. A fine choice. Nobody could write this crap like Mr. Lee. Nobody. I’m fairly certain “did pain me like a canker” is going to enter my everyday phraseology. 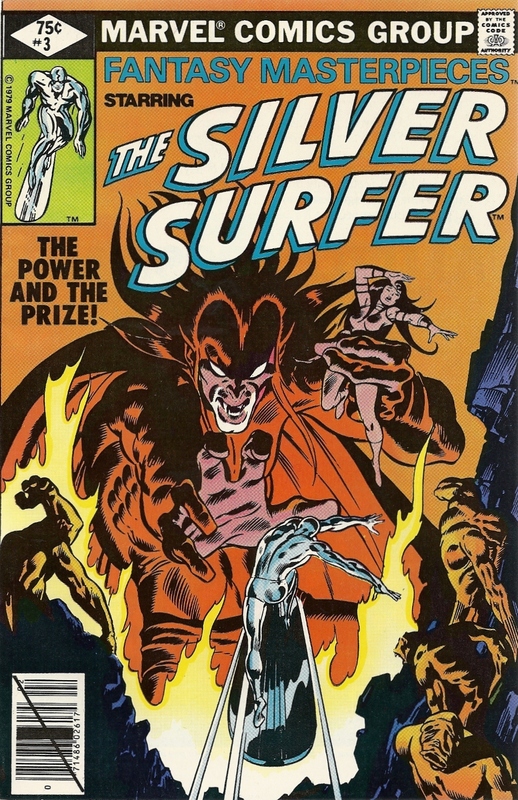 I love the Surfer, and I’d love to get my hands on a lot of these old issues. 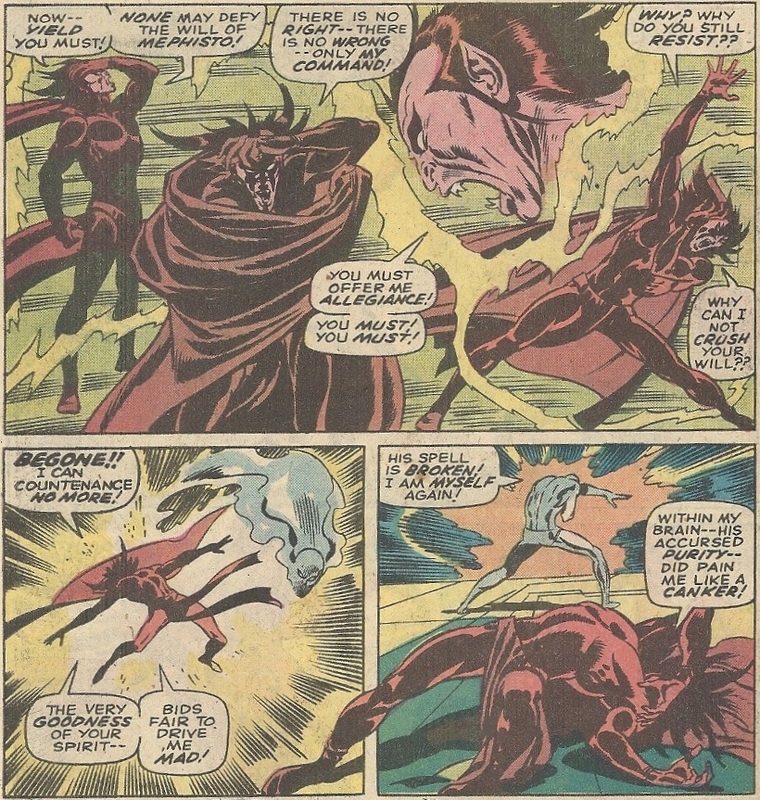 Watching Lee and Buscema go wild with such a spectacular character is like driving with the top down on a crisp sunny day. 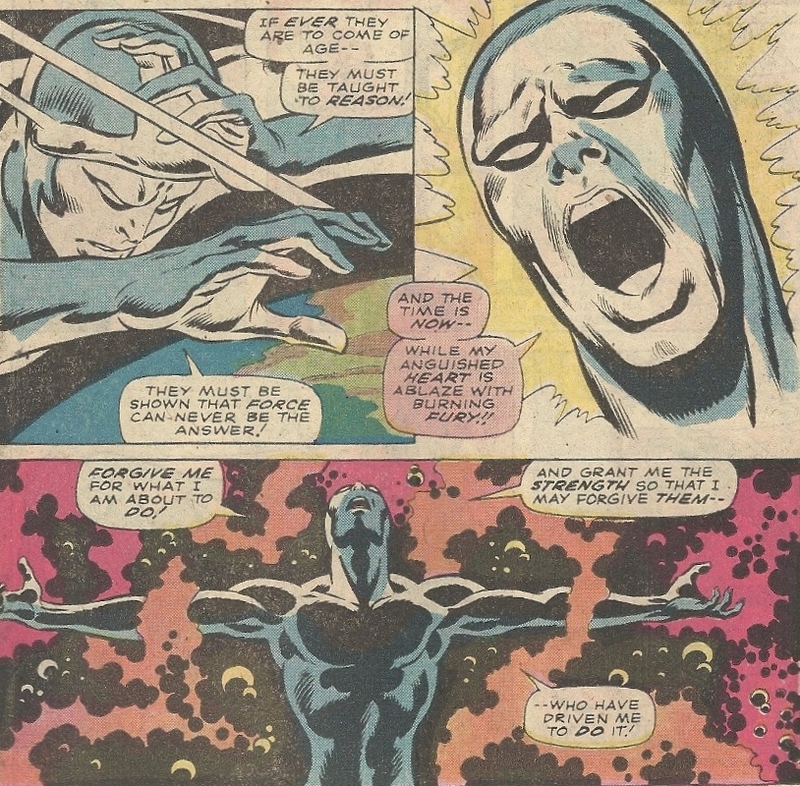 Buscema’s style was particularly well-tailored to the Surfer’s unique isolation and suffering (as in that first interior scan above). Unfortunately, I don’t see the original books around much in good shape, and they’re pricey as all get out when they are spotted. So, since I like comics in comics form, not trades or collections, its nice to have these Fantasy Masterpieces reprints to tide myself over until I’m either less frugal or much, much wealthier. Probably the former. ← Hulk’s fist can’t defeat enemy. Hulk wishes had belt with useful gadgets. You’re too late – “Pain me like a canker” entered my vocabulary back in 1975 when I first saw this tale reprinted in Marvel UK’s The Super-Heroes. I only have Fantasy Masterpieces #1, and I noticed that they discreetly edited out a few pages to reduce the page count. Without having the subsequent issues to check, I can’t say for sure whether they did the same thing with the rest of the series, but I suspect they did. Never mind, I’ll just have to console myself with my original 18 issues of The Silver Surfer in all their complete glory. I occasionally post the covers on my blog (I think the next one due to be posted is #8) at http://kidr77.blogspot.com – feel free to copy them if you wish. I hope to see #didpainmelikeacanker trending on twitter in the near future. You’re absolutely right about the page-trimming, which I should have noted. Even with that, this particular version seemed to go in circles a bit. Good circles, but circles nonetheless.